Karla Carrington opened The Nail Belle, an eco-friendly nail salon, on Malcolm X Boulevard this May. BEDFORD-STUYVESANT — Patrons can get pampered with eco-friendly services at a new nail salon on Malcolm X Boulevard. The Nail Belle, which opened its doors on May 7, is a spot where southern hospitality meets New York City chic, according to owner Karla Carrington. The 400-square-foot space at 199 Malcolm X Blvd. 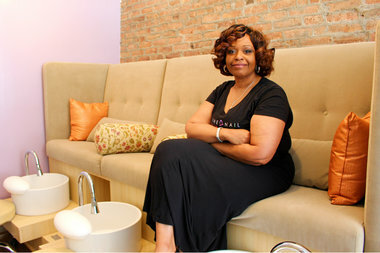 near Putnam Avenue, offers environmentally-conscious manicures and pedicures using carcinogen-free polishes, Carrington said. Known as “five-free” polishes, the brands are free of certain chemicals such as formaldehyde, dibutyl phthalate and toluene. Carrington, who also works in real estate, said her eyes were opened to the amount of fumes and toxins that could be present in a salon while she was training to be a nail technician. “That was everything that had to do with my decision of going green, because of the chemicals. I couldn’t believe how much exposure I was giving myself when I was getting acrylics,” she said. Scrubs used at The Nail Belle are organic and handmade by a member of the team, she said, and the salon offers Calgel and NexGen nail services, which Carrington said are less harmful alternatives to acrylics. Customers can get pedicures at one of three stations with couch seating, and the salon also has two manicure tables. Carrington, who has lived in Bedford-Stuyvesant for the past 10 years, said she looked to fill a need she saw in the area. “I live four blocks from here and would get my nails done in Williamsburg or TriBeCa,” she said. The business is also partnering with recycling company TerraCycle, where clients can bring in products like makeup containers to recycle and raise money for charity. To eliminate waste, workers use crystal nail files that can be disinfected instead of disposable emery boards. “I want this to be an example that yes, we do care about the environment,” Carrington said. The Nail Belle also offers free services to home-bound seniors as a way of giving back to the community, she added. For more information, visit the salon’s website here. Bar Specializing in Craft Beer and Vinyl Records to Open on Vanderbilt Ave.